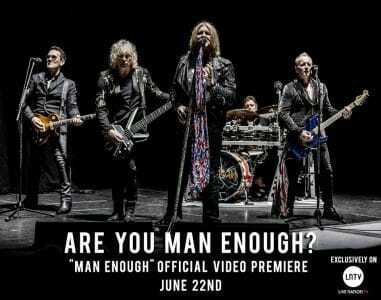 Def Leppard have released a video for their song “Man Enough” from their latest self-titled album, which was released back on October 30, 2015 and which landed the #1 slot on the Sleaze Roxx Readers’ Top 20 Albums of 2015. Sleaze Roxx stated the following in its review of Def Leppard: “My favorite tracks on Def Leppard are definitely the more rocking ones and the bluesier ones. In addition to the first two songs, tracks like “Sea Of Love,” “All Time High” and “Broke ‘N’ Brokenhearted” show that Def Leppard still have that Midas touch for providing faster catchy sing along rockers. Other highlights include “Man Enough” which has a great real funky groove to it and “Battle Of My Own” with its cool bluesy feel to it which feels quite different from what I have heard from Def Leppard in the past. A song like the slower album closer “Blind Faith” shows a more mature sounding Def Leppard with its Beatlesesque sounds, which I like a whole lot better than the sappy poppy ballads that Def Leppard also offer up this time around (or seemingly every time).